John Livious started over in Houston after being evacuated from New Orleans during Hurricane Katrina. Now, flooding has forced him to leave this new city. "Gotta go with your gut," Livious says. "After what I experienced, I ain't climbing through no attic and waiting for no boat to come get me off the roof again. Period." Twelve years ago, Livious was 18 and living in New Orleans' Lower Ninth Ward when Hurricane Katrina struck and the levees failed. Catastrophic flooding sent thousands of storm refugees, like Livious, to Houston. Now, that city is gripped by a catastrophic flood. "Unbearable, because it's like déjà vu," he says. "Witnessing the same thing again." The scars feel fresh, of those first days in the Katrina disaster. "Trying to stay that extra day or two turned into 10 feet of water, 9 feet of water," Livious recalls. "So this time around we did want to get away, which we did beat the flood in Houston. Thank God for that. But now, we're stuck in Beaumont." He's stranded here, but back in Houston, it's worse. "Area that we're staying at is completely underwater," he explains. "But we were able to get memories out this time. Because that's what we didn't save in New Orleans — like pictures and stuff. So we got memories out because that's something you can't replace no matter what." He is worried about his mother, who left with him and is staying at another hotel across the flooded roadway. They were among the estimated 250,000 Katrina refugees who ended up in Houston. As many as 40,000 stayed, including Livious' family. He says his mother started over in Houston 12 years ago, but now, they're back to square one. "That's another hard thing," Livious says. "It's kinda different when you move to a city or state when you have family already. But to move to a city or state where you just know no one? That's different." "We did it. Absolutely. It's America. Home of the brave. You gotta figure it out," he says. "No other way around it. Just gotta pray, stick together, get your head up and just get through it." Livious says he is a survivor and that the people being rescued in Houston right now will get there too. But he warns it takes time. "The hardest thing ... what I know they don't want to hear right now, is they have to be patient," he says. "You couldn't tell me that in 2005 — to be patient when I'm stuck in the Superdome or when we got to Houston and stuck in the Astrodome. But you have to be patient." Now, as Tropical Storm Harvey's deluge has turned to Louisiana, Livious is watching closely. His four sons live in New Orleans with their mother. The disaster that's unfolding in southeast Texas is eerily familiar to people who survived Hurricane Katrina. Twelve years ago today, Katrina hit the Gulf Coast and devastated towns from Alabama to Louisiana. And in New Orleans, where the levees failed, catastrophic flooding sent thousands of storm refugees to Houston. Now that city is in the middle of a catastrophic flood. NPR's Debbie Elliott has the story of one Katrina survivor who is once again running away from the water. DEBBIE ELLIOTT, BYLINE: Much of Beaumont, Texas, is an island with major roads cut off by floodwaters. John Livious is sitting in front of a hotel, looking out as rescue trucks navigate the flooded road in. Conditions here are getting worse. JOHN LIVIOUS: Winds picking up, rain getting heavier, water rising. It's a very bad sight. I wouldn't wish this on anyone. ELLIOTT: Livious came here to escape rising water in Houston early Sunday. Evacuating was an easy call, he says. LIVIOUS: You've got to go with your gut. I mean, after what I experienced, I'm not climbing through no attics and waiting for no boat to come get me off no roof again - period. ELLIOTT: Twelve years ago, Livious was 18 and living in New Orleans' Lower Ninth Ward when Katrina struck and the levees failed. LIVIOUS: It was unbearable because it's - it was like deja vu, just witnessing the same thing again. ELLIOTT: The scars feel fresh of those first days in the Katrina disaster. LIVIOUS: Trying to stay that extra day or two turned into 10 feet of water, nine feet of water. So this time around we did want to get away, which - we did beat the flood in Houston. Thank God for that. But now we're here and stuck in Beaumont. ELLIOTT: He's stranded here, but back home in Houston, it's worse. LIVIOUS: Well, the area that we were staying at is completely underwater, yeah, so far. But we were able to get, like, memories out this time because that's what we didn't save in New Orleans, like, pictures and stuff like that. So we got memories out because that's what you can't replace no matter what. 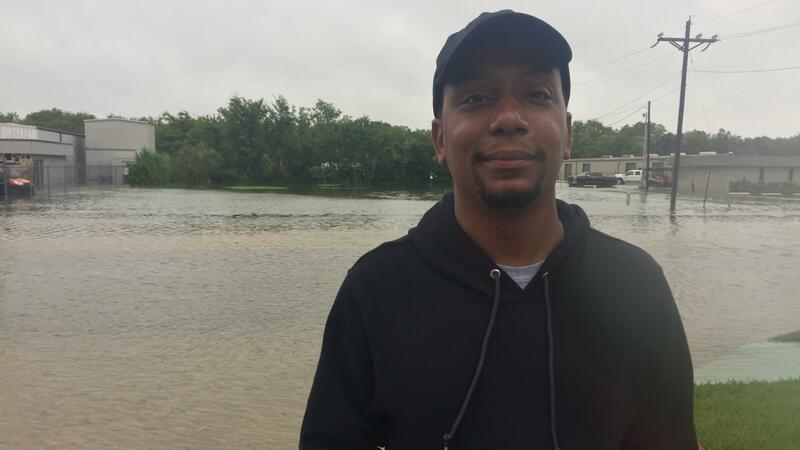 ELLIOTT: Livious says he's worried about his mom, who also evacuated with him and is staying at another hotel across the flooded roadway. They were among the estimated 250,000 Katrina refugees who ended up in Houston. As many as 40,000 stayed, including Livious' family. He says his mom started over in Houston 12 years ago, but now they're back to square one. LIVIOUS: That's another hard thing. It's kind of different when you go to a city or a state where you may have family already. But to move to a city or a state where you just know no one, that's different. ELLIOTT: But y'all did it. LIVIOUS: Yeah, we did it, absolutely, absolutely. It's America, home of the brave. You've got to figure it out, you know what I'm saying? There's no other way around it. You've just got to pray, stick together and keep your head up and just get through it. ELLIOTT: Livious says he's a survivor. And he says people being rescued in Houston right now will get there, too. But he warns it takes time. LIVIOUS: The hardest thing - advice to give them, what I know they don't want to hear right now, is they have to be patient. I'm just being - I mean, you couldn't tell me that back in 2005, to be patient while I'm stuck in the Superdome or, when we got to Houston, stuck in the Astrodome. But you have to be patient. ELLIOTT: Now, as Tropical Storm Harvey's deluge has turned to Louisiana, Livious is watching closely. His four sons live in New Orleans with their mother. Debbie Elliott, NPR News, Beaumont, Texas. Transcript provided by NPR, Copyright NPR.